Burlington City Council President Kurt Wright, incensed by procedural interruptions from council Democrats Ed Adrian and Dave Berezniak during a zoning debate on how tall downtown buildings should be, called police to Contois Auditorium on Thursday night and threatened to have councilors removed if they continued to raise points of order. Democrats voted in a bloc Monday against allowing the regular City Council meeting to continue past 10:30 p.m., aware that they lacked the votes to block an amendment to the zoning ordinance that would allow commercial buildings downtown of up to 10 stories and 127 feet. Mayor Bob Kiss called a special council meeting for Thursday to resume the recessed Monday meeting, but the three-day layoff didn?t calm tempers. Proponents of the amendment, council Republicans, Progressives and the two independents, said the amendment was the result of a year?s work by a joint city council and Planning Commission committee to remedy a flaw in last year?s new zoning ordinance. The flaw had required large downtown developments to be 50 percent commercial and 50 percent residential ? a formula developers said was financially unworkable. That issue was not in dispute. The amendment treated commercial and residential developments separately. At issue was the height. Supporters of the amendment said the increase from 105 to 127 feet for commercial buildings ? an extra story ? would provide an inducement for builders. Opponents, the council Democrats, said the public hadn?t had enough time to digest such a proposed change in the city?s skycap, and said the measure, changed somewhat by the Planning Commission in the version being voted on, should go to the council?s Ordinance Committee for further review. There was no reason to rush, they said. ?There is no compelling reason it has to be dealt with (now),? said Russell Ellis, D-Ward 4. ?There are no builders standing at the gate.? Supporters of the amendment said the Democratic intent was to delay a vote until the new Democratic-dominated council is seated in early April. The tension was obvious early in the debate, as first Joan Shannon, D-Ward 5, then, repeatedly, Adrian, from Ward 1, and Berezniak, from Ward 2, raised procedural points of order on the process being followed to move the legislation. They did that as Jane Knodell, P-Ward 2, was attempting to introduce a compromise amendment that would limit the heights of commercial buildings to nine stories, or 115 feet, and of residential buildings to eight rather than nine stories. ?We?re not going to continue with this,? Wright said angrily as Berezniak raised his hand on another point of order. ?This is unacceptable behavior,? Knodell said. ?It?s not going to be tolerated,? Wright said, as Berezniak persisted, and he called a recess. He stepped outside and called the police. Two officers arrived a few minutes later, with the meeting still in recess. Wright explained quietly to them that some councilors were disrupting the meeting and he might have to have them removed. That, he told the officers, was the ?nuclear option,? and he didn?t want to use it. Whether or not the police presence had an effect, the tone was calmer when the meeting resumed. Knodell?s amendment passed unanimously. The Democratic motion to send the ordinance back to committee failed, and the ordinance finally passed, 10-3, with Shannon, Adrian and Berezniak voting no. The ordinance returns for a final vote on March 30. Two college zoning amendments also passed. The first, dealing with the University of Vermont density, building height and the housing of students on campus, won narrowly. The ordinance had called for the university to provide on-campus housing for 70 percent of its students by Sept. 1, 2014, and 75 percent by Sept. 1, 2017. That provision was removed Thursday, to be dealt with in a memorandum of understanding between the city and the university. Democrats opposed that approach, saying such an understanding was not enforceable. The vote was 6-5 in favor of the abridged ordinance, with Democrats voting against it and Knodell and Clarence Davis, P-Ward 3, recusing themselves. A third zoning amendment pertained to buffer zones around Champlain College and placed limits of 320 new beds (currently 210) the college can build outside the core campus. The council will hold a special public forum on March 23 in Contois Auditorium to discuss the downtown zoning ordinance, and it will revisit the zoning ordinance March in a public hearing before voting that night on the final version. Yeah, me either. The closest I ever got to it was on a trip to Plattsburgh. I hope to check it out in early to mid 2010 after I redeploy back to upper NY. Redstone was selected as developer of the Banknorth Block (bounded by Main, St. Paul, Pine and King Streets) as a result of an RFP process initiated by Banknorth, N.A. The development partners are pursuing a mixed use redevelopment into an exciting housing and workplace community. The first two phases of project are complete. The Hinds Lofts, the adaptive reuse of a historic building at 161 St. Paul Street, is a wildy successful 15 unit luxury residential condominium project completed in 2008 with 90% of the units sold within 4 months of completion. King Street Housing is a mixed-use 42,000 square foot new construction project developed by Redstone?s non-profit partners, Champlain Housing Trust and Housing Vermont. 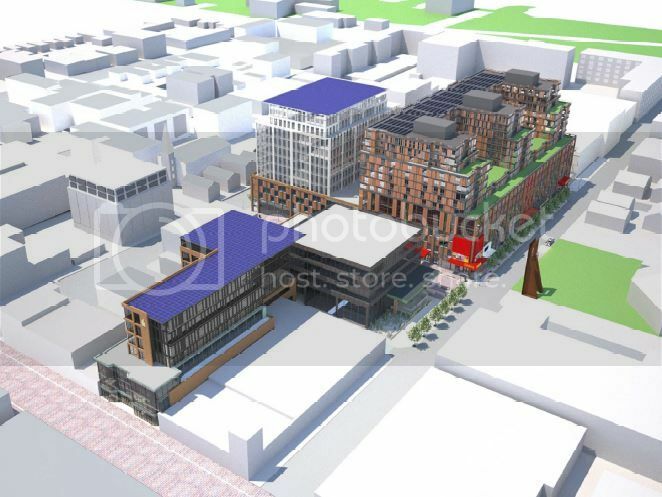 The final phases of the project are in the conceptual stage including the rehabilitation of Woodbury?s Armory at 101 Main Street, an underground parking structure and up to 140,000 square feet of mixed use space. I wouldn't be surprised if there was that much going on. There is a lot of demand to build in Burlington, which has a population similar to portland (when students are counted) but occupies half the geographic space. It is a very trendy town that people enjoy being and living in. When I graduated college there was a ten story building nuder construction. I believe the building in the lower right corner was pre-existing, but I can't remember. I was in Burlington this week and snapped a few pictures. The town/city was hopping. although it is small, it is concentrated, and there is a stretch (Church Street) that goes on for nearly half a mile where there is nothing but stores, people, outside dinning, more shops, bars, etc. All pedestrian, no cars. Right overlooking the lake. Here are a couple. Has anyone heard any news regarding a new UVM arena? I know UVM currently is not seeking public financing for it, but I havent heard anything about it. I know Fogel wanted to have a new arena built by now, but with the economic climate the way it is right now it would be tough to seek public dollars in the state of Vermont. I haven't heard anything. The school's tuition rises and the resources shrink...the priorities some say are out of place. I know there were plans for a convention center in Burlington but a consultant said it would not be feasible given the winter climate. Out of curiosity, do you have a connection to UVM? Patrick- No I was born and raised in rural Connecticut, but after college @ Eastern CT State Univ. I moved to Woburn, MA and now Manchester, NH. I love traveling all around the north east and checking out different urban areas and sporting venues. Burlington, VT is a great college town, I would say a model for a college town, something Storrs/Mansfield CT wish it could be and is in the process of creating. A side note, I really enjoy your blog and what you write about Portland, prob. my fav. small city in the USA. I am an amateur/novice at urban development and planning but love this blog and what is written about the region we live in. Keep it up and hopefully someday you or someone like you will be the mayor of Portland! Thanks for the kind words, Sean. It is nice to know people enjoy reading what I have to say...hopefully you're not the only one! ha! On a side note - One of the good things about cities is that the best ones are organic, not really planned in any strict sense of the word. Modern day professional planning has done more to destroy good cities than it has to create them, so your novice status should not discourage you (and I hope it hasn't) from actively participating in city decision making in Manchester. The best places are those where anyone can say "I know it when I see it, and that's it!" Jane Jacobs was perhaps the most influential person in modern urban planning, and she has absolutely ZERO formal training in the subject, aside from what was a continuous fascination with and observation or cities and urban environments. Looking around, noticing trends and patterns, allows just about anyone who desires to know what ingredients make a good place. That being said, formal education in town planning is usually required these days to have the requisite knowledge for OVERCOMING previous errors. Zoning, as I am sure you know, disallows a lot of good urbanism. So the question is, how do we overcome this obstacle? How do we put back in place commonsensical transportation systems? In my opinion, professional Planning today is either (a) reactive (how do you accommodate more of the same), or (b) progressive and proactive in an attempt to return to a better system of land development. Any novice can say what is good and what is bad, and push for this from a policy perspective, but because so many mistakes have been made in the past at the town level across the nation, there now exists a complex regulatory environment which needs to be navigated to implement even the most obvious solutions....this is where the "experts" come in. I put experts in quotes because it is expertise in a self-created problem, which is a sort of silly concept. Some people advocate for scrapping entire zoning codes, which is tough politically, but that's where people who enjoy good cities, like you, come in. Anyway, this is a long way of saying I hope you don't let your lack of formal education preclude you from making positive changes in your city....I knew as much about local planning in and around Portland before my grad studies as I do now, at the tail end of them. Really the educational part is bringing people up to speed on history, theory, and public engagement, i.e., what's been done, what other people think should be done, and good ole' fashioned participatory conversation. Nothing can stop anyone from reading a quick book on the history of planning, forming their own ideas about what should be done (based on localized knowledge) and engaging in the most basic of human interactions--social conversation, at any scale. Thanks again for your post and please keep reading! I'd be glad to talk to you more at length any time if you have any questions or want to chat about planning or development...just contact me on here or through my blog. We were in Burlington a couple weeks ago and the city really impresses in the summer months. I have a number of other renderings of this project which I may get around to posting at some point. It's using the same contractor as a major Portland project and it's still in its preliminary transactional stages (the contract with the City...P&S?...appears to have just been signed last month). It's an ambitious project but not the first for Burlington on this scale. There was a 10-story building proposed on Church St. about ten years ago that drove people nuts, and at the same time a new 9-story hotel was completed, which I watched rise as a college student at the time. A decade or so earlier, there were also plans for two 16-story residential towers. The University of Vermont has absolutely exploded in terms of construction growth. Since I attended a decade ago, I'd guess about a million square feet of new construction has taken place, including additions to the adjoining hospital/medical school. Right now, they're constructing a major dormitory addition on what used to be the central "green". And anyone familiar with neighboring Winooski knows about a decade ago the entire downtown was pretty much redeveloped in a series of really compact condo/apartment/retail buildings...very successful from what I gather. You mean 01803. 01805 is the ZIP code for Lahey Clinic only. How about a thread name change to Burlington, VT Updates then? I clicked here thinking it was Burlington Mass. How do you change the name of a thread? I reported this thread to the moderators (Statler or vanshnookenraggen) as problematic (using the "caution triangle" / "report this post" on Tangent's post) and asked for the thread-name change. Sorry Tangent, the proper etiquette would probably have been to report myself (or you to report yourself), but either way, the mods know us well enough that they'll see we're trying to be helpful. I'll also report this post as abuse so that the mods can know to remove it after they've fixed the thread name.